The Lensbaby Control Freak joins the ever-growing family of Lensbabies, with macro shooting as its speciality. Succeeding the Lensbaby 3G, the this model features a 50mm multi-coated glass doublet fixed to a flexible tube, although with the Optic Swap System this may be swapped with single-glass, pinhole and plastic alternatives. It also ships with a range of aperture discs as standard, providing control from f/2.8-22. 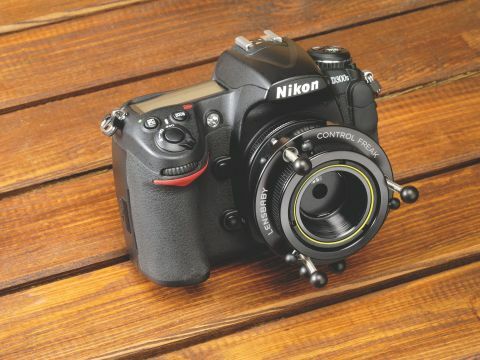 Its step-by-step operation allows the photographer to first focus the lens by flexing its tube, before fixing it in position by pressing the locking button. From here, focus may be fine-tuned by rotating the focusing ring, while the created effect may be tweaked by adjusting the three rods around the side. The lens is held in place until the release knobs are squeezed together, at which point the lens springs back into its default position. The lens isn't designed to be operated in the same manner as a standard objective - instead, the photographer needs to position their thumbs on the rear of the camera and let their fingers do all the bending, before adopting a more conventional hold. This can take some getting used to, and, naturally, it slows things down, but for macro work and still-life work this is unlikely to be problematic. More extreme effects can also produce vignetting when used on full-frame cameras, although with cropped-sensor bodies it's harder to introduce this. With a 30cm minimum focusing distance, it's also debatable whether it can truly be described as being suitable for macro and close-up work. For a fun but essentially novelty accessory, its £250 asking price may be considered steep, although no doubt some of that cost is reflected in the quality of the glass. Luckily, though, it's available in all common DSLR mounts, including Sigma and Four Thirds.